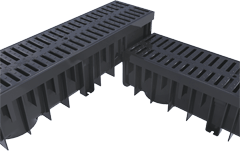 A drainage channel ensures proper drainage for your terrace, driveway or pool. 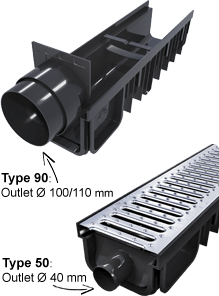 Prevent your terrace from flooding with this drainage channel kit. 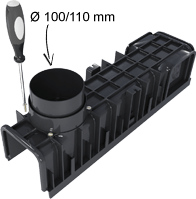 The drainage channel drains all water through the entire channel and thus prevents puddle forming on or subsidence of your patio area. by combining the channel parts. 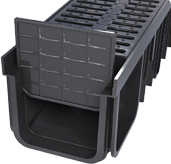 Choose between a plastic or galvanised grid. Both are non-slip and high-heel proof. For an easy connection to the sewer or gravel drain. The side-outlet can also serve as stopend! Select below a plastic or galvanised grid by clicking on one of the images below. Both are certified for load class according to the EN-1433 standard.